Durham is about 15 miles south of Newcastle upon Tyne and 65 miles north of York and is easily accessible by car, rail, coach and air. Park B will only be opened once Car Park A is full. 07.00 and 19.00 on Saturday 9 June 2018. Local charges apply. Please note that no vehicles will be permitted beyond Car Park A without a valid site access permit. You should use the relevant postcode below to obtain driving directions online or on your satnav. Signs for the Regatta should be posted on major routes into Durham. 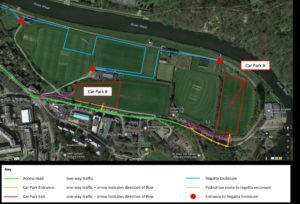 Parking in the Regatta car park is very limited and we strongly advise you to use the Durham Park and Ride, or park in one of the city centre car parks (such as Prince Bishops car park), and complete your final journey by public transport or on foot. The primary park and ride site is Belmont (near the A1) – post code DH1 2SR. The Belmont Park and Ride (operates on weekdays and Saturday only) can be found just off Junction 62 of the A1. Exit the roundabout onto the A690 towards Sunderland, and turn left at the traffic lights. Buses operate between all park and ride sites and Durham Bus station located on North Road, every ten minutes between 7 am and 7 pm. To walk to the Regatta from the Bus Station, use the instructions found here, beginning at instruction 3. The post code for the Prince Bishops car park is DH1 3UJ. The post code for the Regatta car park is DH1 3JU. Exit at Junction 62, signposted for Durham. Then follow the A690 (dual carriageway) towards Durham City Centre. At the first roundabout, take the third exit, continuing on the A690 down the hill. At the next roundabout, turn left to cross Leazes Bridge. Stay in the left-hand lane, to turn left onto Old Elvet at the first set of traffic lights, just after the Marriott Royal County Hotel. Continue along Old Elvet and take the second left onto Green lane (about 0.2 miles). The Regatta car park can be found immediately on the left hand side, through the entrance to the University Pavilion. Classic cars and competitors with boat trailers should continue to the end of Green Lane and follow the single track lane to the designated areas. Follow the directions to the Regatta car park and continue to the end of Green Lane. All boat trailers must be parked in the trailer area adjacent to Durham Amateur Rowing Club, unless prior arrangements have been made with the Entries Secretary. 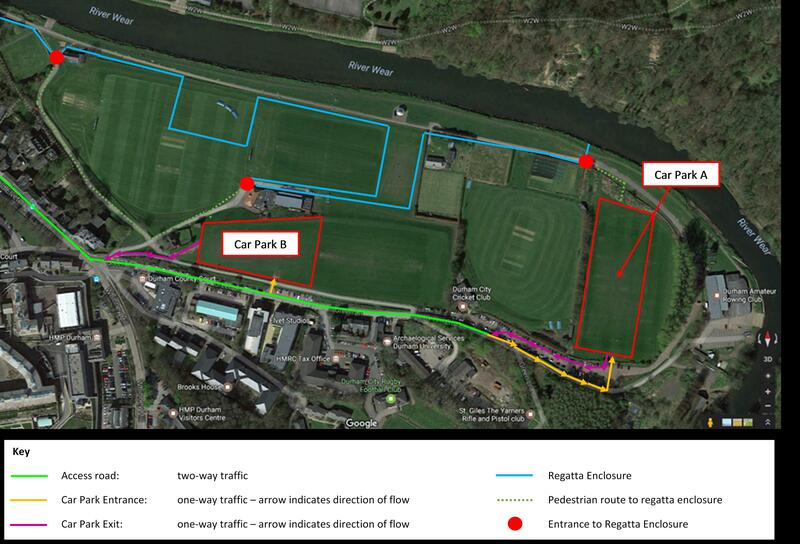 Follow the directions to the Regatta car park and continue to the end of Green Lane. Durham Station is on the East Coast main line, between Newcastle and Darlington. The following table will give you an idea of travel times. A full list of train services and schedules can be found on the National Rail web site. It is about a twenty-minute walk to the Regatta site from Durham Station. The walk is clearly sign-posted for pedestrian access. Exit Durham Station and follow the road (Station Approach) down the hill. At the end of the road, turn left onto North Road and cross the roundabout to continue on North Road on the opposite side of the roundabout. Proceed down North Road past the bus station and turn right at the Sainsbury’s Local (continuing on North Road). Turn left onto Framwellgate Bridge (the pedestrian street). Once across the bridge, follow Silver Street up the hill to the Market Square. As you enter the Market Square, bear right onto Saddler Street (next to Nationwide Bank). Take the second left onto Elvet Bridge (by the steps opposite Waterstones). Turn right at your first opportunity through the arch (follow the signs towards Flat White Coffee Shop). Then follow the lane down the hill under the bridge. At the riverbank, bear left and continue along the riverside path upstream, past Browns Boathouse. Turn right and cross the river on the footbridge (Baths Bridge) and, once across, turn left to enter the Regatta enclosure. National Express coach services operate from several UK cities and stop at Durham Bus Station on North Road. For visitors using the Durham Park and Ride (operates on weekdays and Saturday only), buses operate between all park and ride sites and Durham Bus Station on North Road, at ten-minute intervals between 7 am and 7 pm. Bus services 20, 58 and 59 all stop within 0.25 miles of the University Pavilion, which is located on Green Lane adjacent to the Regatta race course. The Regatta enclosure can be accessed from Old Elvet, by proceeding down Territorial Lane and turning right onto Elvet Waterside. As you exit the bus station, turn right and proceed down North Road and then turn right at the Sainsbury’s Local (continuing on North Road). Turn right and cross the river on the footbridge (Baths Bridge) and, after crossing, turn left to enter the Regatta enclosure. The nearest airports are Newcastle International to the north, and Durham Tees Valley to the south. From Newcastle International, take the Tyne and Wear Metro (light rail service) to Newcastle Central Station and continue by train to Durham Station. From Durham Tees Valley Airport, a bus service connects the airport to Darlington railway station, where you can catch a train to Durham Station.